VIP SMOG is a STAR Smog Check Station. Getting your smog check should be an easy and affordable process. Whether you are in Sacramento , Rancho Cordova, Elk Grove, or any of the surrounding areas, VIP Smog station can get your smog test done quickly and efficiently. We pride ourselves in excellent service provided by our courteous and friendly staff for over 16 years. Here at VIP Smog check, we give our customers the best customer service experience around. That’s why we offer more than just the standard smog test service. We are registered by DMV to issue registration tags. 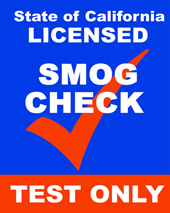 Get your vehicle smog certificate at our shop and we can renew your registration and tags as well. Don't wait in line at DMV. Get it all done at your own convenience here! VIP SMOG INC is the BEST choice.